Every day your team postpones using innovative AI-powered solutions in your content marketing, you’re losing competitive edge. If this sounded a bit dramatic, great. It’s supposed to be to get your marketing team on its toes and prepared to embrace AI-powered marketing tools. Artificially intelligent systems constantly work on the background of popular products and services such as Netflix, Amazon, and, naturally, Google. In the past few years, though, AI has paved its way deeper into marketing, helping brands to enhance every step of the customer journey. Moreover, tools previously available to enterprise level companies have become affordable and accessible to medium- and small-sized businesses. To better understand the latest machine-learning applications in marketing, I consulted with Markus Lippus, chief technology officer at MindTitan, a company focused on developing AI-powered solutions. Our conversation led to these eight ways to leverage AI to beat (or at least compete with) your content marketing competition. Most marketers allocate their pay-per-click budgets to AdWords and Facebook. According to eMarketer, Google controls 40.7% of the U.S. digital ad market, followed by Facebook with 19.7%. Most pay-per-click ad campaigns are managed by either in-house teams or a PPC agency. In other words, humans. But AI can help you uncover new advertising channels that may not be used by your competition. Albert, an artificial intelligence marketing platform, provides a service – autonomous media buying. This approach requires little human input while AI analyzes, manages, and optimizes paid ad campaigns. Key takeaway: If you work with large-scale PPC campaigns, machine-learning algorithms can help you find new ways for optimizing your layout, copywriting, targeting, and bids. While AI’s capacity is far from being able to build new websites from the ground up, it can help you enhance your visitor experience with intelligent personalization on your site. Website experience – By analyzing hundreds of data points about a single user (including location, demographics, device, interaction with the website, etc. ), AI can display the best-fitting offers and content. Push notifications – Thanks to behavioral personalization, push notifications can be specific to individual users, delivering them the right message at the right time. The 2017 Real-Time Personalization Survey by Evergage notes that 33% of marketers surveyed use AI to deliver personalized web experiences. 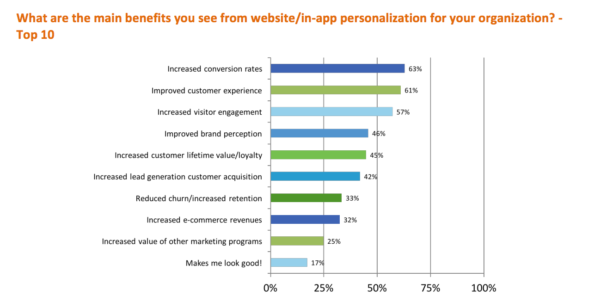 When asked about the benefits of AI-powered personalization, 63% of respondents mentioned increased conversion rates and 61% noted improved customer experiences. Both publishers and consumer brands such as The Wall Street Journal, Pandora, La Redoute, and TopFan use an AI-powered approach to improve their conversion rates and differentiate from competition, as Boomtrain reports. Pandora, for instance, brings together human curators and machine learning algorithms to suggest new songs listeners might like. Music listening services give us many good examples of competitive advantage achieved by delivering the best user experience. If you’re working with large quantities of content, algorithms can help to surface the most relevant ones for each individual user. AI also can enable you to recognize when data flow stops or unexpected traffic is visiting your site. While you can’t check your analytics to know what’s happening every second, an AI tool such as Hunch can. 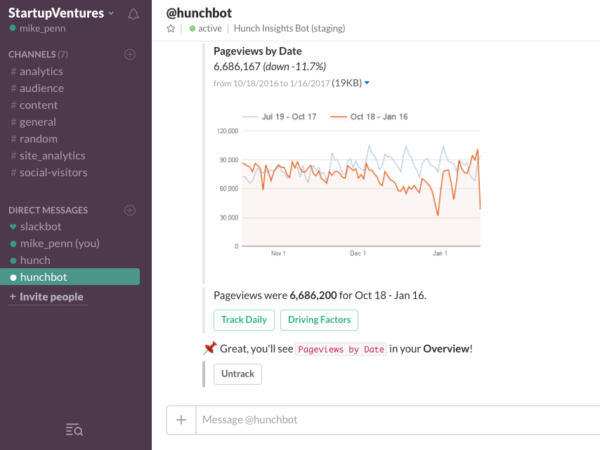 The AI-powered Slackbot analyzes your Google Analytics data and sends insightful reports on general performance and large-scale changes in data. That information can help you keep websites up and running perfectly, as well as address anomalies as they arise. Key takeaway: At a time when customers expect increasingly meaningful experiences, you can use AI to automate a huge part of personalization. As a result, your blog visitors could see the most relevant content, notifications, and offers based on their location, demographics, and browsing history. 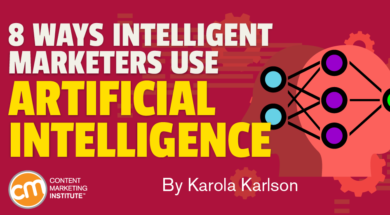 Should You Trust Artificial Intelligence to Drive Your Content Marketing? Natural-language generation holds tremendous potential in making the work of content creators more efficient. By 2018, Gartner predicts, 20% of all business content will be authored by machines. Every AI-generated narrative is designed to read as though it’s written by a human. The data insights and writing style of each narrative depend on the rules and formats established by your brand to best serve your audience. In addition to content creation, AI-powered marketing tools like Rocco can suggest fresh social media content that your brand’s followers are likely to engage with. Key takeaway: Even though an AI-generated e-book or research report is still science fiction, you can use AI tools to automatically generate email content, personalized reports or messages, or to curate content for social media. If you’ve recently chatted online with a customer service rep, your helpful correspondent named Ashley or Jen might have held a little secret – she’s a bot. From fashion to health to insurance, intelligent chatbots are providing borderline magic customer support. And in some cases, they’re better at creating personalized content than humans. But chatbots aren’t limited to direct customer service interactions. 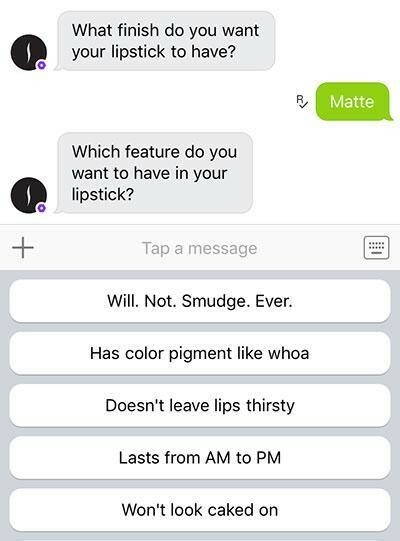 For example, Sephora’s Kik bot opens with a mini quiz about the user’s makeup preferences. For users interested in learning more about a specific product, Kik opens a next-level dialogue box with multiple customized options. 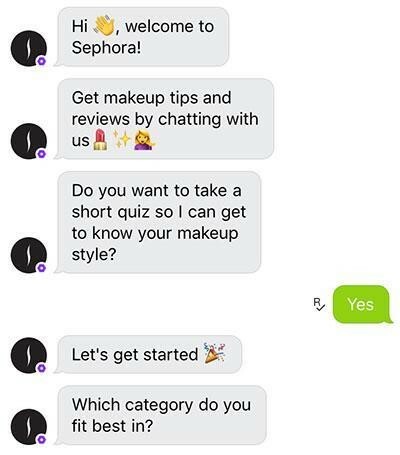 Sephora’s example proves AI-powered chatbots can provide advice in the research phase, giving way to a new form of content marketing. Key takeaway: Nowadays, AI-powered chatbots are commonplace. However, you can take the opportunity to take your customer chat to the next level with personalized content marketing. Think about ways to employ AI agents as proactive advisers for every online visitor, not just for direct customer service interactions. Your team often spends hours compiling and scheduling weekly emails to multiple customer segments. Even with smart subscriber segmentation, you can’t deliver a personalized email to every single customer. 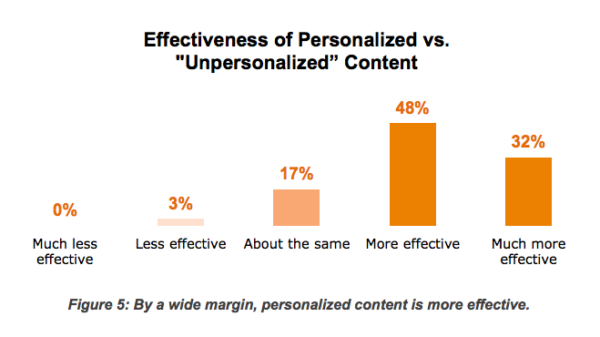 Yet, a 2016 study by Demand Metric found that 80% of marketers say personalized content is more effective than “unpersonalized” content. That’s when artificial intelligence enters the game. Algorithms can map a subscriber’s website experience and email browsing data to understand all the individual’s interactions with your content. This knowledge allows the algorithm to identify hyper-contextual content to create one-on-one personalized emails. Key takeaway: Artificial intelligence makes it possible to send personal curated emails to every single customer. By analyzing a customer’s reading patterns and topics of interest to recommend specific content most relevant to that person, AI-assisted emails could become even more engaging for every single subscriber. TIP: Not all AI-backed systems are capable of learning from user feedback. As you evaluate AI tools, make sure to see if that learning feature is included. Machine-learning algorithms also can help identify disengaged customer segments that are about to churn or leave for a competitor. AI-powered tools in this category can help gather data, build a predictive model, and test and validate that model on real customers. That information can indicate what stage of churning the person is in. While quick-churn customers (users who abandon a product shortly after starting to use it) are difficult to re-engage, late-churn customers (those who have a long-lasting relationship with your brand) can be incentivized to keep using your product. AI-powered churn prediction helps to analyze omnichannel events and identify dropping customer engagement. For example, if the system notices churn-indicating behaviors like lower usage time, it can send users relevant offers, push notifications, and emails to keep them engaged. Key takeaway: When combined with personalized content creation, AI-powered churn prediction helps keep more of your customers engaged, leading to higher lifetime value and profits. As churn prediction is unique to every product and company, the machine-learning algorithms need to be adjusted for your company or built from the ground. With that information, you can create more effective content to be delivered to disengaged users. Where it would take humans an immense amount of time to crunch all the numbers and match them to customer’s behavioral patterns, AI can give marketing insights on the fly. Dynamic Yield helps the likes of Under Armour, Sephora, and Urban Outfitters build actionable customer segments by using an advanced machine-learning engine. Key takeaway: AI can help you display the most relevant products – or content – based on how the visitor has interacted with your company from the website through the shipping department. If you’ve recently used Google Photos, you may have noticed how good the system has become at recognizing people and images. In recent years, software has become superhuman at recognizing people, with accuracy exceeding 99%. 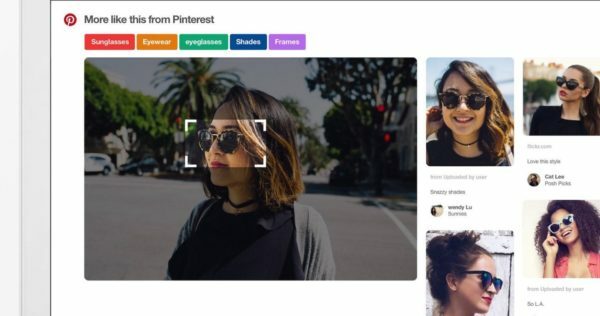 Big brands like Amazon, Facebook, and Pinterest are using AI-powered image recognition to identify people and objects from images and videos. From a marketer’s standpoint, image recognition could mean a better sync between online content and store visits. Many stores use facial recognition software to trace customers’ in-store visits and link these videos to their customers’ profiles. As many as 59% of U.K. fashion retailers deploy facial recognition software in their stores. When combined with AI-managed push notifications, stores can send real-time discount offers and welcome messages to individual visitors. Key takeaway: The data gathered from in-store facial recognition adds another layer – a significant layer – to customizing the content experience for your store visitors. Knowing how the person shops enables you to create and deliver even more targeted one-on-one messaging. Facial recognition software also can be used as a measurement tool – now you can track the offline ROI of your online campaigns. AI enables marketers to fulfill a dream previously considered impossible – to engage with every individual customer in a personalized and meaningful way. Look for opportunities, from automated content curation to personalization, where AI can make the biggest impact and result in the highest ROI. Make sure your data is sufficient for the algorithms to learn from. Be careful not to be too aggressive with personalization – all your marketing messages and content experiences should seem natural to users. You’ve been affected by AI in your content marketing for years, now it’s time to intentionally apply additional AI products to deliver personalized experiences and beat your competition. Want to automate your content marketing learning? Subscribe to the CMI newsletter and every day at the same time you’ll receive a new insight, tip, trend, and more.